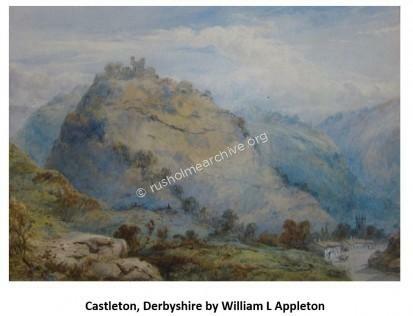 The watercolour above was painted in 1874 by William Laithwood Appleton. 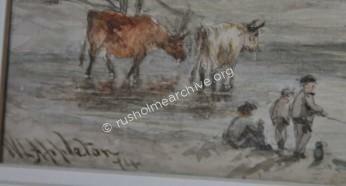 Watercolour paintings like this, depicting a rural landscape were a very popular genre during the Victorian era. 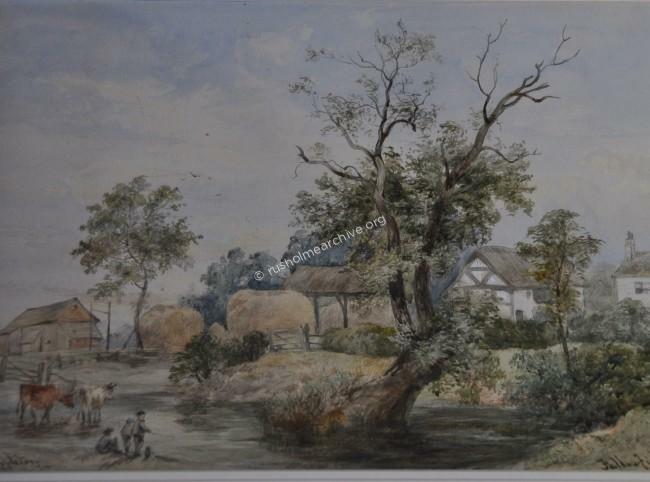 The name of the painting is ‘Fallowfield’, signed and dated 1874 and on the rear of the cardboard mount is a note by the artist identifying the farm. I will be exploring more work of William Appleton and his daughter, Rosa, further down this page. 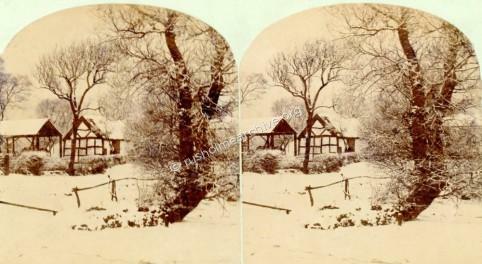 Below is a photographs by Helmut Petschler, the German born photographer who lived nearby on Egerton Road, Fallowfield. 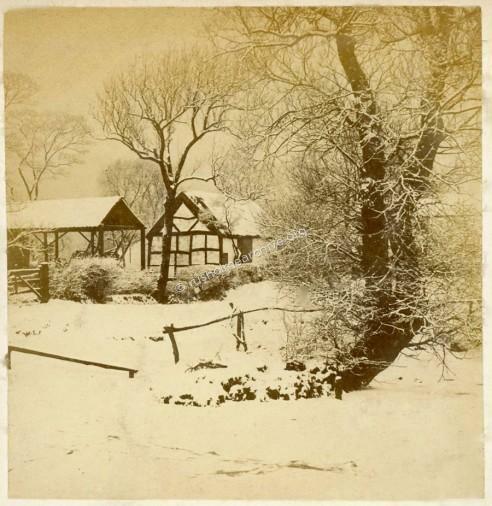 This photograph in the snow of Lower Oak Farm must have been taken a few years earlier because Helmut Petschler died in 1869. Most of the photographs taken by Helmut Petschler were for use in stereo-viewers; by the 1850s, photography for stereoscopes became a new form of technology. ‘Stereoscopes’ preceded the publication of photographs in newspapers and magazines, so stereo viewers were seen as a form of entertainment. People would pass around the stereoscope and see all sorts of beautiful scenes that they otherwise might never have been introduced to. The photograph of Mary Brooms farm can also be seen below the original in its stereoscopic form – I found this image in an American collection! 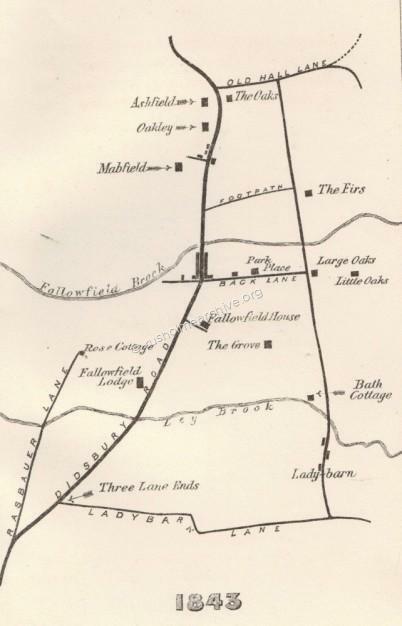 Mary Brooms Farm was in fact known as Little or Lower Oak Farm and can be seen in the map of 1843 below; this map is taken from the book, “‘Sketches of Fallowfield and the surrounding Manors, Past & Present’ by Mrs WC Williamson. 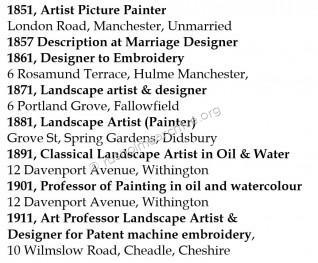 The address of the artist, 4 Alfred Terrace, was probably on Alfred Street, adjoining Portland Grove, Fallowfield. Portland Grove is on the western side of Wilmslow Road and is opposite Carrill Drive, it can be clearly seen on the 1904 OS map below. 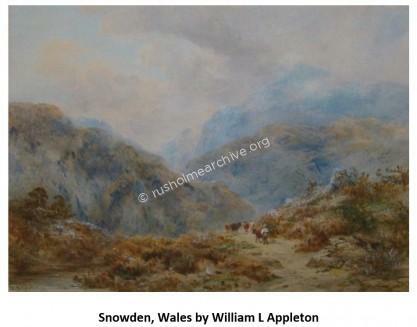 William L Appleton would no doubt have been quite familiar with the view of Lower Oak Farm. 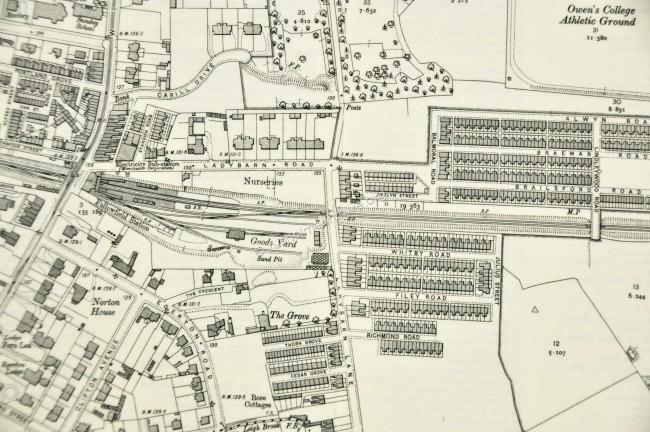 In the map below of 1893 there are some houses near to the 20 acre farm and more significantly perhaps, Fallowfield Railway Station, (now the site of a Sainsbury supermarket). I have used the word significant in respect of Fallowfield Station because the train enabled people to travel very quickly into Manchester, (at this time the electric trams were still a decade away), and this major improvement in transport was an important reason that Fallowfield developed so rapidly.. The earliest and most easily accessed document that identifies the Broom family farming at Lower Oak is the 1841 census. 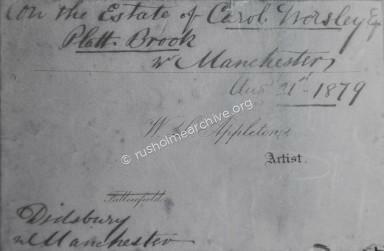 The Broom family were tenants of the Worsley family who lived at Platt Hall and probably the Worsley family archives have rent rolls for Lower Oak farm that date back further. 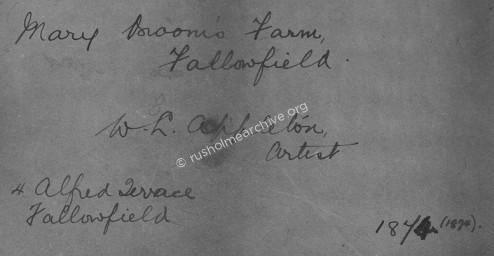 However in 1841 Samuel Broom, Sarah Broom and their daughter Mary were living at Lower Oak farm. Mary had at least three other sisters, Hannah who eventually married John Toon, he was a farmer at Blackstock farm, which was situated immediately south of what is now Manchester Royal Infirmary. Another sister, Anne was a dressmaker and Unice, who was married in 1840 to Thomas Grundy, a book-keeper. “We are only tenants, and shortly the great Landlord will give us notice that our lease has expired”. The more comprehensive 1851 census return shows considerable detail. Sarah Broom, aged 70 identifies herself as farmer, 20 acres, employing two men. There are the three daughters, Mary, Hannah and Anne; two male lodgers, one was called John Rowbottom, described as a surgeon, (20 years later in the 1871 he is still at the farm but described as a servant??). There were servants living at the farm, George and Mary Harrison, (described as farmers servants), presumably married and their one year old daughter Sarah, finally fourteen year old Joseph Pownall described as a ‘general servant’. What is surprising is the number of farm workers and servants employed on a 20 acre farm, but of course labour was cheap and there was no automation; cows were milked by hand, hay to be cut by scythes etc. Mary Brooms mother, Sarah, died in March 1857 and was also buried at St James, Birch-in-Rusholme, in all probability sharing the same grave as her husband Samuel. Mary is now the tenant at Lower Oak Farm and identifies herself as ‘Woman Farmer’. 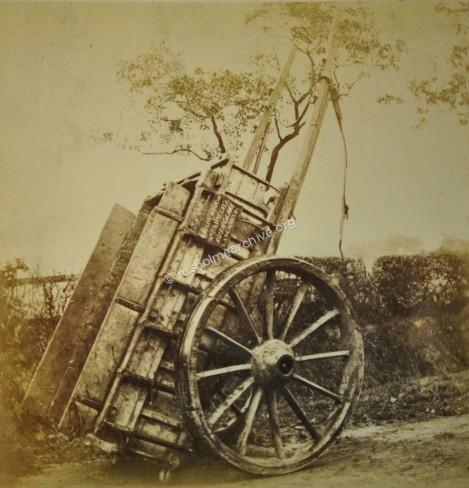 This can be seen on Mary's farm cart, photographed by Helmut Petschler, see below, the close-up of the cart clearly indicating 'Mary Broom, Wm Farmer'. In the 1861 census amongst the ‘usual family and servants’ is a new name, Thomas Grundy aged 17 and described as an agricultural labourer. He is the son of Mary’s sister Unice who had married Thomas Grundy in 1840. Ten years later in the 1871 census Mary Broom is still the head of the ‘family’ and Thomas, her nephew is still a farm labourer. However as Mary reaches the age of 70 in 1874 she apparently retires and in April 1875 Thomas is now identified as being responsible for the local rates. Mary retired to Parkfield Street in Rusholme and died there in January 1881. Mary was buried in the graveyard at St James, Birch-in-Rusholme, (presumably in the same plot as her parents? ), her sister Hannah being the executor of the will, it being valued at £300.00. Thomas Grundy continued farming at Little Oak Farm until 1896, there are 2 postcard views in the Manchester Central Library Archives dated 1885/90 and identified as Grundy’s Farm, Ladybarn. Reproduced below by kind permission of the Manchester City Archives you can assume the man standing behind the hedge is Thomas Grundy? In 1897 Thomas Grundy becomes the tenant of the farm at The Firs estate, barely half a mile away. The Firs estate was created by Sir Joseph Whitworth and eventually gifted to Manchester University. During Thomas Grundy s tenancy The Firs was occupied by C P Scott, editor of the Manchester Guardian. 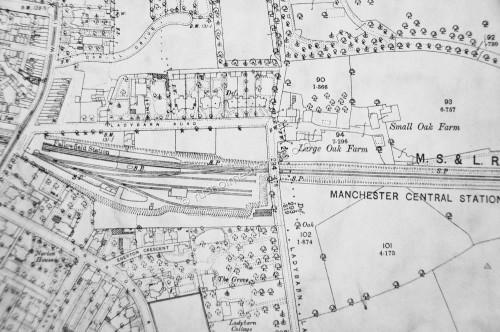 I have no doubt the value of the farmland in Fallowfield tempted the Carrill-Worsley family at Platt Hall to sell the land for residential development, as mentioned in an earlier paragraph the 1904 OS map clearly illustrates the terraced housing that replaced both of the Oak farms. In 1937 Rachel Ryan, the grand-daughter of CP Scott, (editor of the Manchester Guardian who lived in Fallowfield) wrote, ‘A Biography of Manchester’. Chapter 3 is a ‘Leafy Suburb’ and in this chapter Rachel recalls her early childhood in Fallowfield. . The following paragraph give a clear and valuable contemporary view of Fallowfield when it was still considered a village. “Fallowfield still kept something of a country air, in spite of the ugly new building. A few farms remained among the houses, and their milk floats delivered milk and eggs and cream to Fallowfield households. Each float had a perilous backward slope to its floor, and the gay jingle and rattle from the harness and bouncing milk-cans made pleasant music along the Fallowfield roads. On hot days in summer each pony wore a straw hat, and on May Day his mane and tail would be plaited up with ribbons and a cockade fixed in his cheek-strap". 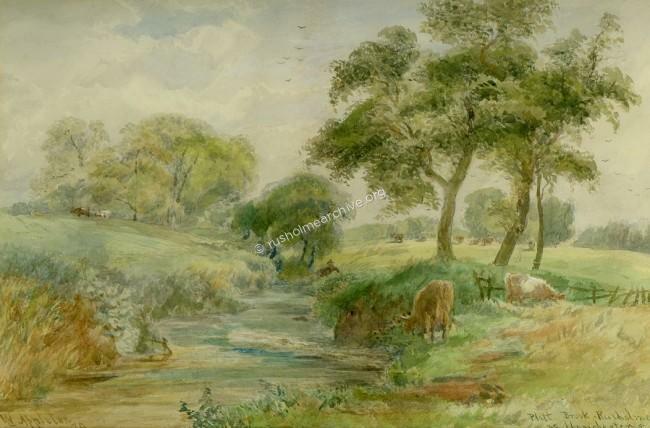 The watercolour above is titled ‘Platt Brook, Rusholme, Nr Manchester’ Aug 21st 1879. The card below from the back of the picture frame are the notes of the artist, William Laithwood Appleton. The watercolour above does show a much romanticised view of what we now call Platt Fields. William Laithwood Appleton certainly has exercised a considerable amount of artistic license in his portrayal of Platt Brook, here set in a parkland that might have been designed by Capability Brown. William Appleton was born in Manchester, probably in 1831, in the absence of seeing a birth certificate he was certainly baptised at Manchester Cathedral in October 1831. His parents were David and Mary Appleton, his father a barber, and William appeared to have been one of six children. William Appleton was 26 when he married Emma Depear in 1857and they were then living at Boundary Street, Hulme. Within five years they had two girls, the eldest Emily, dying when she was only 9 and buried at the then fashionable Ardwick cemetery. Rosa the younger of the two girls followed in her father’s footsteps and became an artist. Williams wife Emma died in 1884 at the age of 52 and the father and daughter partnership as artists continued until at least 1911. “The Manchester School of Painters was formed by a number of disgruntled young vanguard painters in the 1870s. They were deeply influenced by the artist, Joseph Knight who was a successful painter, etcher and photographer. He was the founder member of the Manchester School of Painters. Knight painted how “he” desired and refused to conform to traditional Art School rules and this appealed to his young admirers. Twice weekly they would all meet up at Knight’s studio in York Place behind the Union Chapel in Oxford Road, Manchester to discuss new ways to develop their techniques. The group were very discontented with the old school of teaching and working. They decided they would work in a different way, experimenting with different tones and colours especially after a number of them spent four months working in the open air in Pont-Aven, Brittany. The place was vibrant and full to the brim with an eminent and cosmopolitan crowd of painters known as the Pont-Aven School and the group became influenced by all their different ways of working. 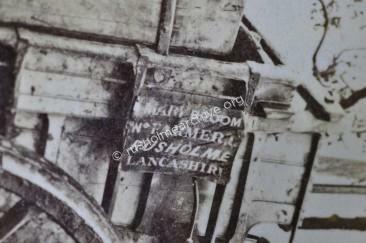 "Born in Rusholme his first school was Birch, and later Withington. At sixteen he went to the Manchester School of Art and studied under its head, Mr. Buckley (1868–70). He often exhibited at the Royal Manchester Institution. In 1873 he became a full member of the Manchester Academy in which he played an extremely active business role for forty-three years. 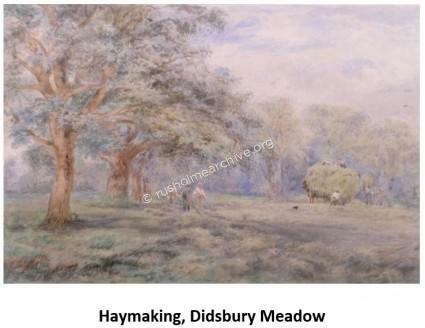 The two local paintings that I have acquired are shown above, I have also recently seen another watercolour of Didsbury. There are sure to be other examples that perhaps are awaiting to be discovered. To have successfully made a living selling this style of watercolour must have required a great deal of travelling and time – It was common practice amongst the Manchester landscape artists to spend the summer months travelling and sketching; then back in Manchester in the winter finishing work prior to exhibitions and hopefully sales. William mentions in the census of being a designer, perhaps this implies he did work as a commercial artist, – there must have been many opportunities in the cotton trade and this might have subsidised his ‘fine art’. 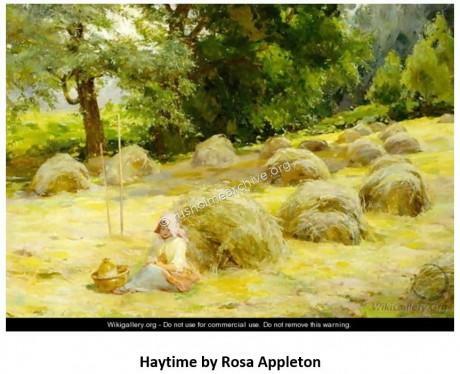 A report in the Manchester Courier referred to the 1888 Manchester Academy of Fine Arts Annual Exhibition at the City Art Gallery; Rosa might have been a member, she sold a painting in the exhibition; “An old cottage – Langdale” for four guineas, (£4.20). Rosa was awarded a free studentship by the Manchester Academy of Fine Arts in 1892, another report in the press regarding her work referred to her still life studies – I have not come across examples – like her father a number of landscapes she painted have survived, i.e. 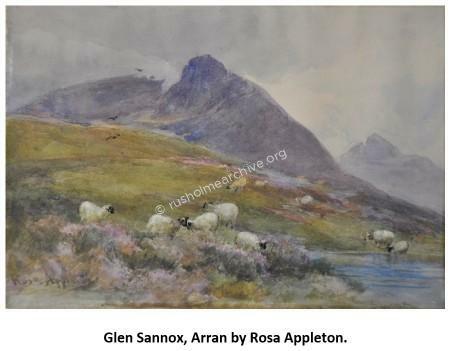 There is a watercolour by William that was also painted on the Isle of Arran and dated 1901, they must have visited Arran together so the painting above is probably also from 1901. The 1911 census was the first to enquire about health and in that column the entry for 79 year old William referred to ‘Natural Decay’. If William Appleton was unwell he managed to survive until January 1916 when a notice in the Manchester Evening News referred to his death at the home of his nephew, Isaac Appleton who lived at ‘Edenwood’, 37 Albert Road, Levensulme. William was buried on the 31st January at Southern Cemetery in the same grave as his wife Emma. Probate was granted to his nephew Isaac and was just £56.10s (50p); perhaps a year’s wages for a labourer. For me the real legacy are the watercolours that he painted, I can always share his romanticized view of Platt Brook or the view of Mary Brooms farm in Fallowfield. As for Rosa and her remaining years I have searched without any success, whether she continued painting I have found nothing. Rosa Appleton died in 1945 at the age of 82, unmarried she had been living in Wilmslow and was buried with her mother and father at Southern Cemetery 6th February 1945.